Keeping a colony alive through early Spring is always a bit nerve-wracking – is it too cold for them to break out of the cluster and come up to the feed, are they strong enough to find the fondant and make use of it, when should one stop feeding…? As to this last, the photo below shows what happens when the weather suddenly turns just that bit warmer and instead of a deficit of food in relation to need, there’s suddenly a surplus and nectar coming in. This fondant pack was put on when the temperature was still regularly below 10C and all was well for the first two weeks; it was directly on the frames (with a narrow eke to give a little more space) and being made use of. How quickly things can change (and why don’t bees read books). 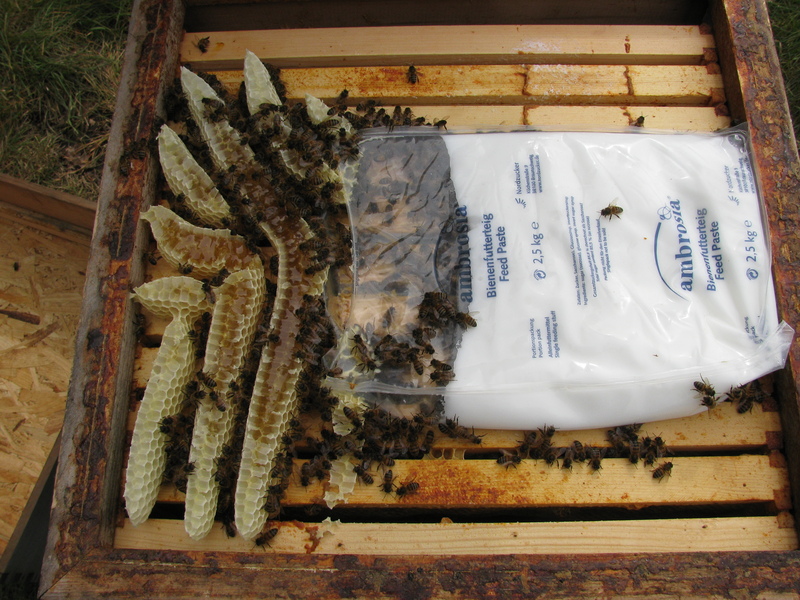 This entry was posted in How to, Ifbeescouldread and tagged bees and their little ways on 23/04/2014 by whbbeekeepers.